Evanston Francophiles are no strangers to Montreal and Quebec, two world class cities just north of our border that can immediately make you feel as if you’ve landed in France. However, we recently discovered one of Quebec’s hidden treasures, a picturesque region loaded with history, culture, and culinary delights. Recently in the news for hosting the G7 Presidency forum and G7 Summit, there’s never been a better time to visit Charlevoix. Here’s how you can do it in 48 hours. If you’ve love French food and culture, you’re no stranger to Montreal and Quebec City, two postcard perfect cities just a few hours north of Chicago. We don’t need to tell you what to do there; you already have your favorite spot for poutine or steak frites or wine at the base of the Funicular. But what we did discover on a recent sojourn in Quebec is a region that is a bit off the beaten path—a taste of Colorado beauty with a French accent better known as the Charlevoix Biosphere Reserve. All it took was one glimpse of what awaited in this magical region to lure us out of the old city for an extended weekend of alpine adventures with panoramic Laurentian Mountain views of the St. Lawrence River. And there’s a pretty cool story to go with it. Seems all this splendor was caused by a meteorite crashing just east of Baie-Saint-Paul to just west of La Malbaie more than 350 million years ago, creating dramatic peaks, fjords, and valleys that are truly a sight to behold. 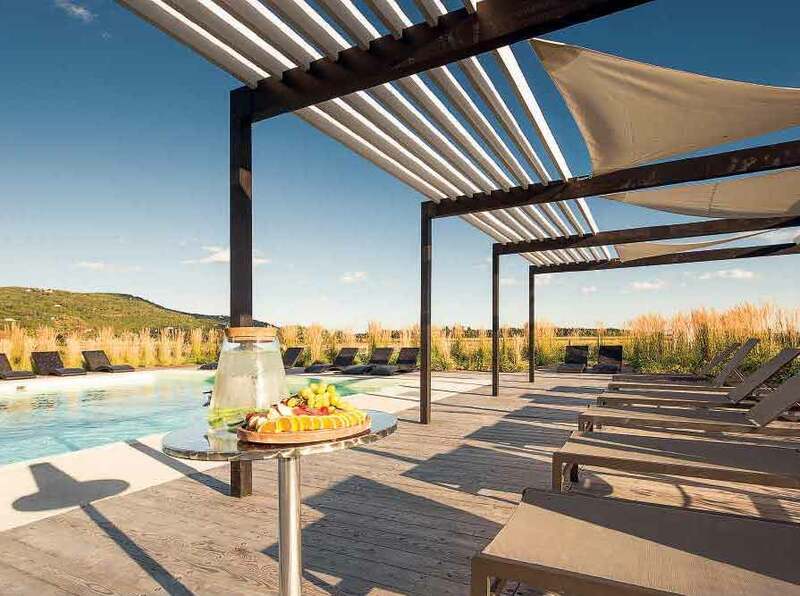 The Spa Nordique Le Germain offers a thermal spa experience that includes a Finnish sauna, eucalyptus steam bath, hot and cold outdoor pools and even a snow fountain. You will need to rent a car for this side trip, but unlike traveling in Europe, driving in Canada is the same as driving in the U.S. All the signs are in French but you will learn to adapt (besides, apps like Waze do the job and direct you anywhere you need to go). Another piece of pre-departure planning is to be sure to bring that French phrase book. While most waiters and hotel staff in Québec City or Montreal happily speak English, many out in the countryside do not. Consider it an adventure. Our tour of the UNESCO region of Charlevoix went from Saturday to Monday, giving us two nights and most of three days. And while it’s possible to pull off a 48-hour visit, you may want to consider adding more time to explore and participate in many of the spectacular seasonal activities (which include everything from golf and water sports to dogsled rides and alpine skiing). If you happen to go in the summer time, you can even do some whale watching or play with elephants in the biosphere. 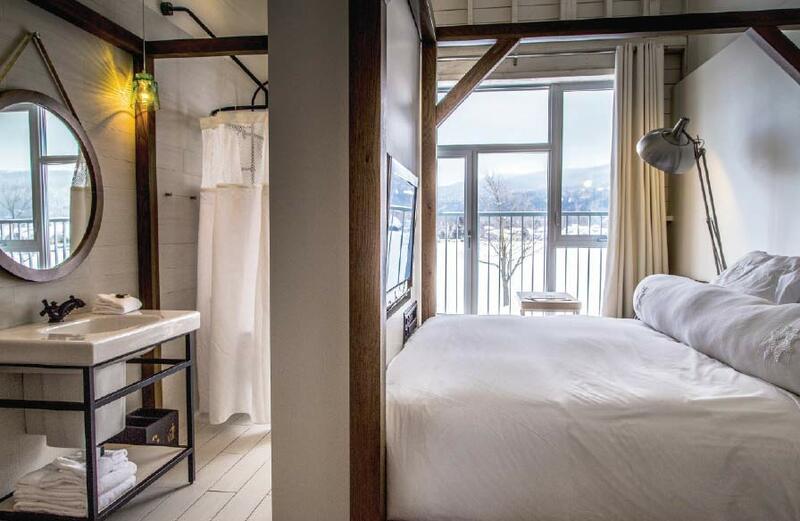 Rooms at Le Germain Charlevoix Hotel and Spa are designed to evoke nature and the surrounding farm land. Located just on the edge of the city of Baie-Saint-Paul, the resort has a train line that runs directly to Quebec City and is a popular destination throughout the year. From Québec City, we drove just over an hour to the quaint provincial town of Baie-Saint-Paul. A stop at the Mousse Cafe for lunch (moussecafe.ca) is a great introduction and shows what is being done to turn the town’s historic convent into a bustling community cooperative. Just a few blocks away, you will check into a “country hotel” that is far more urban and trendy than what you just left in Québec City. Le Germain Hotel & Spa Charlevoix (legermainhotels.com) is an award-winning retreat with a Nordic-style thermal pool and outdoor spa facilities that feel exotic and decadent in the cold winter air—all complemented with a sauna, steam bath, and aromatic snow dispenser. Indoors, the styles are trendy and contemporary, juxtaposing the farm setting with award-winning designs and a different layout for each room. What’s wonderful about Le Germain is that even though it’s close enough to walk to town, there’s no reason to leave. There’s even a train station and regular trains that run from the city in summer months. 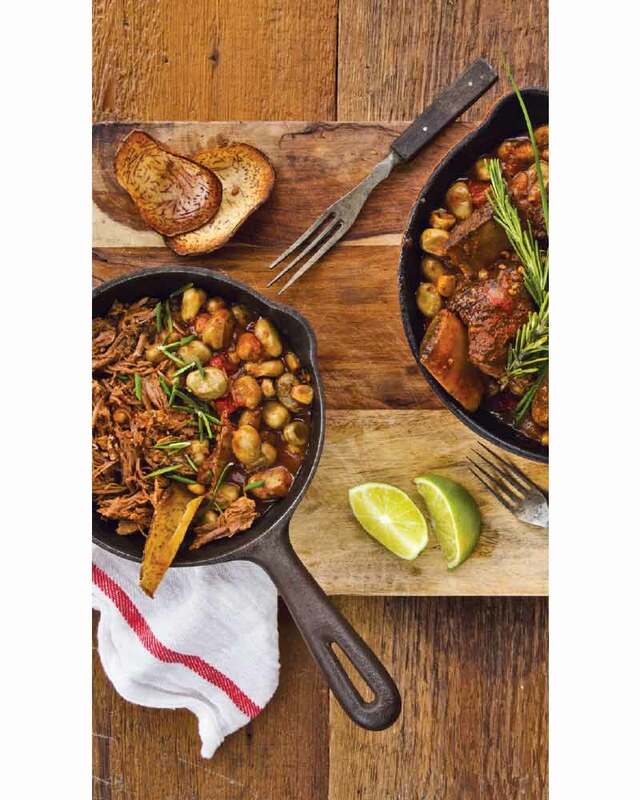 A casual lounge-like restaurant is available, along with a coffee shop and an upscale restaurant that specializes in regional cuisine. All the meals are fresh and delicious and a great pairing with the fresh country air. If you’re in Charlevoix for winter sports, this is the place to call your base. With a variety of room options, it’s perfectly appointed to host everyone from couples to families to large groups of friends. After a breakfast buffet at the hotel, it will be time to head out on the road to La Malbaie, this time taking the St. Lawrence River Route 352—considered one of the most scenic roads in North America. Skirting the St. Lawrence River, this rue offers breathtaking views at every turn and the opportunity to stop off and explore nearby municipalities. Charlevoix is a culinary delight, with chefs creating unique dishes using fresh ingredients and region delicacies. Once arriving in Pointe-Au-Pic, you will be welcomed by the owner of Café Chez-Nous (cafecheznous.com), a French brasserie style bistro offering healthy ingredients, delicious crépes, and a full bar menu. It is just what you need after a nice drive and gets you fully immersed into the local scene. From there, it’s off to Musée de Charlevoix (museedecharlevoix.qc.ca), a small museum that’s worth every minute. A knowledgeable guide will walk you through the history of the region, telling stories about the people who have lived there for generations and the industries (from lumber to folk art) that sustained them through the centuries when Charlevoix was more remote and transportation was more precarious. All those items checked off the itinerary, it’s time to head to the final stop on this sojourn—a luxury landmark hotel that may look very familiar to Le Château Frontenac in Québec City. 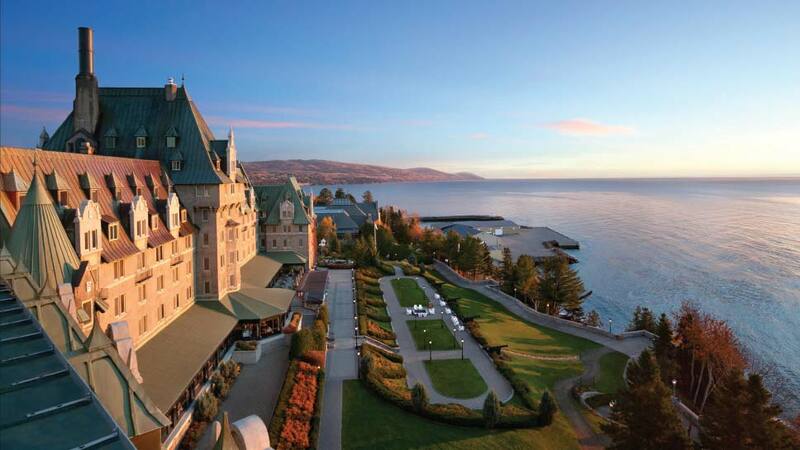 Arriving at the Le Manoir Richelieu (which like Frontenac, is a Fairmont Hotel property) blends the rich history of Québec with the relaxing postcard setting of La Malbaie. Nestled high up over the river views out over mountains, the resort (fairmont.com/richelieu-charlevoix/) has that same “castle-like” feel as others in that famous series of Canadian Pacific Railway properties. With 405 rooms, four delectable restaurants, outdoor thermal pools, and an enticing outdoor Jacuzzi, this is a favorite among those visiting the nearby ski resorts of La Massif or Mont Grand-Fonds. It’s also the perfect place to stay when touring the famous Charlevoix area Flavor Trail (a gastronomic delight) or visiting the Hautes-Gorges-de-la-Rivière-Malbaie national park (sepaq.com/pq/hgo/). 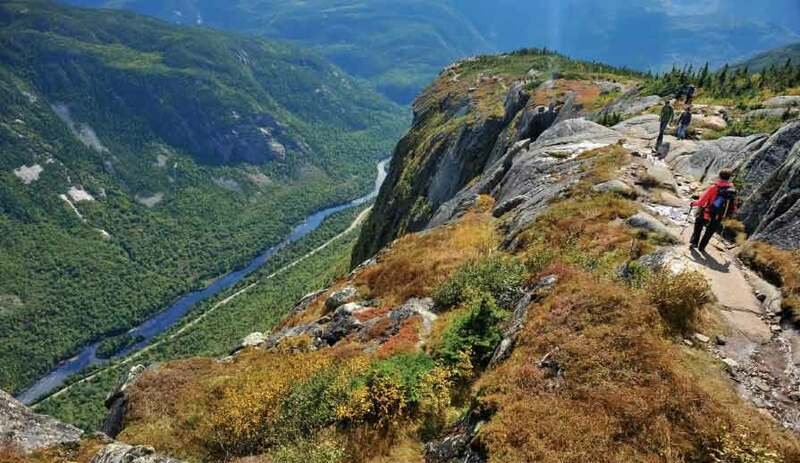 With a dramatic landscape of fjords, bays, and a rolling terrain, the Charlevoix region has been designated as a World Biosphere Reserve by UNESCO. Winter activities abound, as do opportunities to stay within the resort and enjoy a sumptuous aromatherapy massage at the new Spa du Manoir Richelieu—a welcome haven of relaxation and tranquility. Finish off your last night with evening supper at the Table & Terroir restaurant, where extraordinary creations by Executive Chef Pierre-Laurence Valton-Simard are served in a cozy, yet elegant setting. The memory of that last vista of lights sparkling over the river is something you will carry far beyond your arrival back home to Evanston, as is the knowledge that with every night spent in Québec, your mastery of the French language improved un petite peu, and your view of North American history will never be quite the same.